January 27th saw an Eastern Phoebe appear at the Willow Pond at The Beanery and both Canvasback and Eurasian Wigeon were at the Corbin City Impoundments. Back to today though, and what was most interesting was that Tom Reed reported another Nashville Warbler at the Mauricetown Bridge - two in one day - are they moving? What is presumably the male Eurasian Wigeon that had been in the state park until the turn of the year was found at Pond Creek Marsh lunchtime and finally, a little further away but of interest, two Iceland Gulls were reported from Barnegat Light this afternoon. Red-headed Woodpeckers continue to be reported from Cox Hall Creek WMA, including this smart adult [photo by Debbie Hudson]. 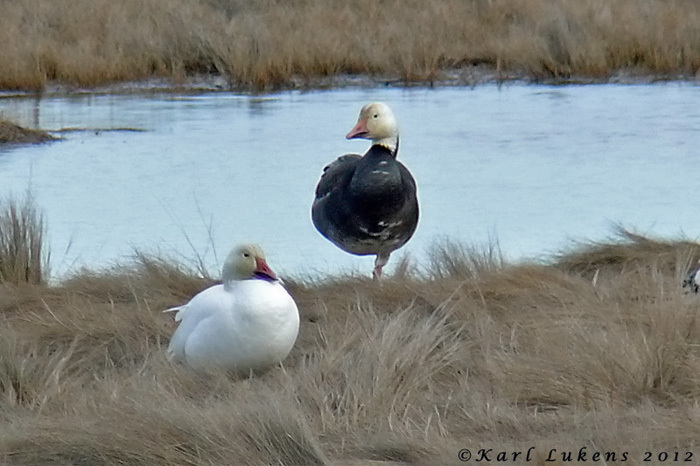 A fine portrait of the two color morphs of Lesser Snow Goose. The darker form - often called a Blue Goose - is most common in eastern populations of the Lesser Snow Goose. Though it occurs in the Greater Snow Goose too, it is much less common in that subspecies, whilst 'blue' Ross's Geese are rarest of all. These two birds were photographed by Karl Lukens at Brigantine recently. This female Common Goldeneye spent three days on Lake Lily this week but was not reported today. It is usual to presume that not much is happening in the way of bird movements in Cape May in January, but the last 24 hours has suggested otherwise. Hottest news involves a male Western Tanager, found at the intersection of Cape Avenue and W. Lake Drive around 4PM this afternoon. Unfortunately it flew off westward all too soon but may well still be in the area and will be looked for tomorrow. It headed off between Oak and Alexander Avenues into an area that was too well wooded and scrubby to get into. 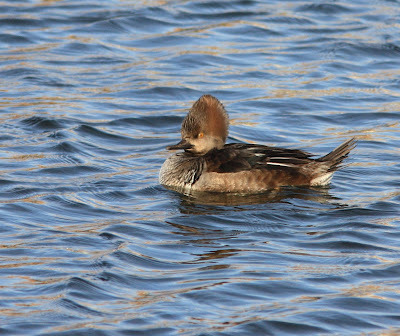 On Lake Lily, at least 25 Hooded Mergansers were present today (there having only been four there recently until now) as well as a female Common Goldeneye - a scarce bird south of the canal. The Cackling Goose, male Greater Scaup, juvenile Common Merganser and female Redhead continue on Lake Lily today. Just as intriguing as the tanager comes a report of an adult male Painted Bunting at a backyard feeder in Cape May which first appeared on 21st and was still present on 24th. The site is currently unviewable but news will be put out if the bird moves to a better location. It is tempting to think that this may be the same bird that was on Bayshore Road back in early December and has perhaps been lurking somewhere ever since; but perhaps it - and the tanager - are evidence of bird movements here even at this time of the year. Interestingly, I noticed at least four Gray Catbirds calling in the last 24 hours after having had none for several weeks, as well as two Fox Sparrows at Higbee's Beach this morning and calling Golden-crowned Kinglets at Higbee's and the state park. Warren Cairo reported a Yellow-breasted Chat still present at the state park today. A run of dreary, gray days seems to have kept people away as messages of local birds have been a little thin on the ground lately. Despite the weather, though, there has been a few goodies around, starting with the gulls that Tony posted about on Saturday. It was a strange day - three good gull species in a Cape May contect, yet none of them really hung around to be seen again. The Black-legged Kittiwake hasn't been reported since it moved off south on Saturday, the Iceland Gull turned into a mere fly-by (though Chris Hajduk had what was probably the same bird again on Monday at the Coastguard Unit, but viewing conditions were poor). The Glaucous Gull did stay for a while but was selective in who it showed itself to and hasn't been reported since Saturday. Continuing birds include a Lark Sparrow in Ocean City, along the dune edge at the end of Seaview Road and Waverly Boulevard, up to nine Snow Buntings, two Orange-crowned Warblers and a Yellow-breasted Chat at the state park, Yellow-breasted Chat at The Beanery, two Tree Swallows at Cape May Point, the Dickcissel on Harvard Avenue and the three Eurasian Collared Doves along Whilldin Avenue and environs. The Rufous Hummingbird was still at Goshen at least to January 21st and at least one Black-headed Gull continues along the bayshore in Villas/North Cape May. The first round of our winter raptor survey on Sunday 22nd produced a rather thin collection of wintering raptors, but I'm tempted to think that this is more to do with a mild winter than a real drop in population numbers. Time will tell. Having birders out in a concerted effort to count raptors always pays dividens in other ways though and reports of interest that evening included Tricolored Heron and American Bittern at Avalon Boulevard and House Wren and Palm Warbler at Dennis Creek WMA. Also of interest, Tom Reed had at least two Red-headed Woodpeckers along Cooks Beach Road on 20th and Clay Sutton reported a Golden Eagle at Corbin City Impoundments the same day. Finally, a large whale was sadly beached at Ocean City on the 23rd and, I presume, is now dead. There were pictures on the web but not from the right angle to see which species was involved. So, quiet for birders, but still things to be enjoyed out there - indeed, the topsy turvy mild winter continues to produce surprises with Orange Sulphurs still flying today - Will Kerling had two, I had one at Higbee's Beach and Jimmy Dowdell reported one from Bivalve in Cumberland County - our first record outside of Cape May County this winter. Will Kerling reported seeing a dead Black Rat Snake on the road a week or so back which I presumed could have been an individual that was wintering in a basement or somewhere else relatively warm as it seems pretty early for any reptiles to be about, but I was amazed to see the head of a turtle (presumed either Red-bellied or Painted) taking air in Lake Lily today! Anything is possible it seems! Don Freiday started things off this morning, texting at 8:26 that the adult Black-headed Gull that has been wandering the southern Cape May County Bayshore was with Bonaparte's Gulls off Miami Ave. in Villas. I quickly bounced out of my house to find it, as I had been looking from the yard quite extensively this month without seeing the beast. It was raining, visibility was not the best and I could not find much in the way of small gulls; I went back inside. 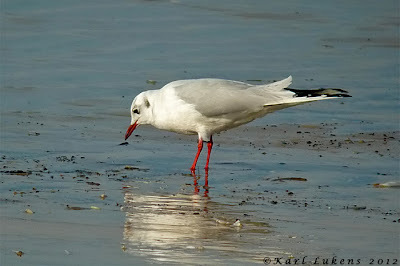 Then, Larry Scacchetti texted at 9:17 that there was a Black-legged Kittiwake at Miami Ave. with the Bonaparte's Gulls! I bounced out again and, lo and behold, there was an adult Kittiwake! While occasionally seen from Cape May Point and other sites on Cape Island, kittiwakes are quite rare up the Bayshore. Sam Galick got some nice pictures of the bird, one of which is below. Shortly after seeing the Black-legged Kittiwake, I found the adult Black-headed Gull flying into the gulls on the spit north of Miami Ave. It eventually started heading south, so I bolted into the house to get my camera and managed to get back out to the back deck just in time for the bird to fly right by (see below). Then, Mike Crewe found an Iceland Gull flying south past Sunset Beach a bit before 11:00, which Scott Whittle later found on the beach at St. Peter's, Cape May Point. Now, a quick update, the white-winged gull at St. Peter's is, apparently, a Glaucous Gull. Also there were the two Tree Swallows that have been lingering in the area since before Christmas. Updates to come. Somewhere in the dark depths of our overwhelming desire to have everything orderly, organized and explained, we feel the need to categorize and label the days, the months, the years. Of course this makes sense; we need reference points by which we can arrange to meet each other ("Let's meet up again next Thursday at 10:00am to continue this discussion") and reference points by which we can record history ("Christopher Columbus arrived in North America in 1492"). But though it would appear to be pretty straightforward to define a day, and maybe even a week or a month, defining a year seems far more tricky. What am I babbling about? Well, I had a short conversation with Will Kerling yesterday lunchtime and we touched on the issue of exactly when the old year ends and the new one starts. And we meant in the context of natural history; in other words, the wildlife's clock, not ours. What had inspired this conversation? Essentially, this winter's weather. Wildlife neither knows nor needs such rigid calendars as ours. Animals and plants live their lives day by day, responding to conditions on a daily basis, which can result in some real puzzlers for us as we try to work it all out. Yes, the shortest day of the year for those of us in the Northern temperate zone falls in mid- late December, but the coldest, darkest days of winter probably occur in late February for most of us here. So when exactly does the wildlife 'turn around'? In essence we have a complete overlap of wildlife events and Will and I were drawn to this by the Orange Sulphurs that are flying around the Wild Radish at Cape May and by the Skunk-cabbage flowers that were already blooming by December 12th. In our rigid world, we would record the butterflies as the 'first of the year' and yet, as Will pointed out, they are still flying from last year, they haven't stopped yet. In contrast, the Skunk-cabbage may be recorded as our last flower of the year, and yet it is actually the first, as Skunk-cabbage pushes its sinister maroon flowers up well before its leaves unfurl. Such apparent contradictions in the natural world are of course all part of what makes it so fascinating and with trends in regional weather patterns well-recorded as being on a long-term shift (so-called climate change), recording such events is an extremely useful way to record such long-term changes. So what's happening in your part of the planet right now?! Orange Sulphurs readily survive a mild winter and will continue to do so as long as their is nectar available from introduced plants in gardens and fields. (This one was photographed back in September when the leaves were still green!) Such species of butterfly are actuall continual-brooded in the south where food is available all year, so don't really have a start and an end to their year [photo by Mike Crewe]. Though the winter in Cape May has so far been relatively mild, we have still had a few spells of consecutive days with temperatures below freezing. During such periods, it is very difficult for animals to get water - particularly when there is no snow to eat as a substitute. Do make sure that if you feed birds you provide them with a source of water during such periods. This may mean regular trips into the garden to replenish frozen birdbaths (and remember that electrically-heated ones are not environmentally friendly!) but our little feathered friends are worth the effort aren't they? 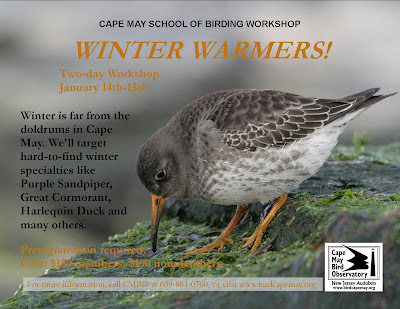 This weekend just past saw a merry band of us out and about around cape May for our Winter Warmers workshop - and boy did we need those warmers! You would think that spending two whole days in temperatures that never once got above freezing point (coupled with a keen wind most of the time) would be off-putting - and you would be right! But we persevered and had some wonderful birding moments. Saturday morning started with an adult Bald Eagle as pretty much the first bird of the weekend and continued with a party of 12 Snow Buntings which alighted in the middle of the parking lot. Continuing with close comparisons of Lesser and Greater Scaup along with amazing close views of the wintering Dickcissel, the day was turning out well! Our second day along the barrier islands provided similar great experiences with plenty of shorebirds to study, including four Marbled Godwits in an American Oystercatcher roost and wonderful close views of both Red-throated and Common Loons. Though Avalon appeared to almost completely devoid of seaducks, we nevertheless had excellent close views of displaying Long-tailed Ducks and spectacularly close Purple Sandpipers. Add onto that all the other winter wonders that came our way and we certainly all went home happy! The great thing about birding, of course, is that every day, month or year is different to those that went before and you just never know what is going to happen next. Since my last post (time flies when you are busy!) there has been a nice range of birds reported, the presence of which could certainly be attributed mostly to the mild winter we having (at least up until last Saturday!). Sam Galick reported an Osprey passing over Middle Township on 13th, Vince Elia found a Tricolored Heron at Bivalve in Cumberland County on 14th and the Bell's Vireo was reported at The Beanery again on 15th - along with an over-wintering Yellow-breasted Chat. 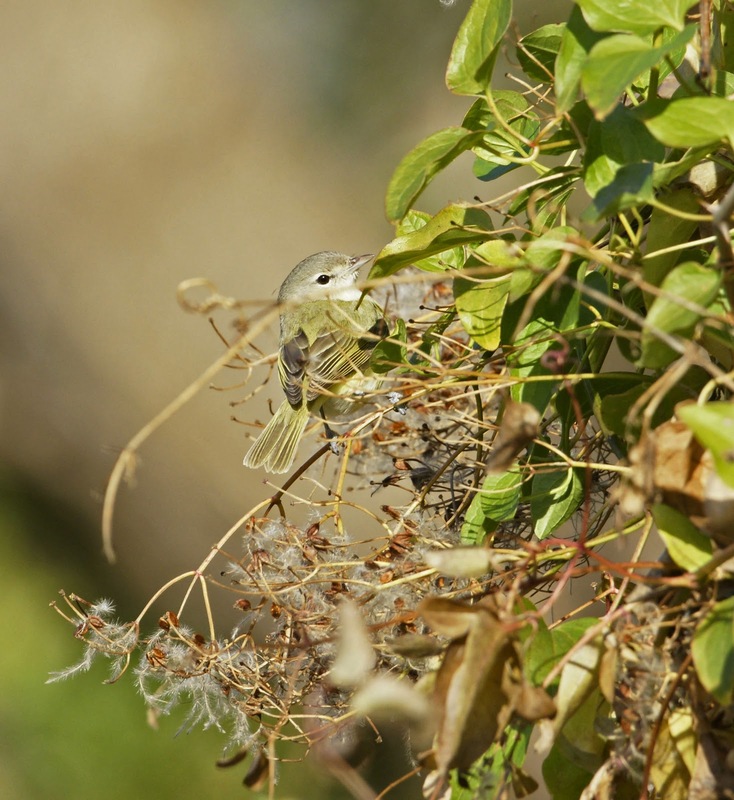 An Orange-crowned Warbler has been reported on several occasions along the red trail in Cape May Point State Park, though generally remains elusive and two Tree Swallows are currently moving around Cape May Point, mostly in the St Mary's area. Also riding out the cold weather of the weekend was our female Rufous Hummingbird at our Center for Research and Education at Goshen. Yellow-breasted Chat in a typical thick tangle at The Beanery [photo by Roger & Kathy Horn]. Reports from further afield include a Golden Eagle at Brigantine on 14th, two female King Eiders at Barnegat Light, a Short-eared Owl at Jake's Landing on 15th and a few Rough-legged Hawks around, including two at Tuckahoe WMA (Corbin City side) and three at Mott's Creek near Brigantine. 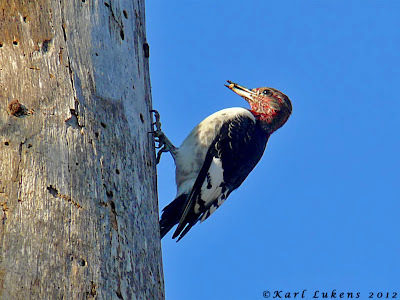 Finally, back on the 'you never know what you are going to see when you get up in the morning' line, Karl Lukens had a young Red-headed Woodpecker in his yard on 15th - an intriguing record south of the canal for this time of year. At least four and perhaps as many as seven of these birds are being reported regularly from Cox Hall Creek WMA so maybe they're moving around a bit more with the changing weather. 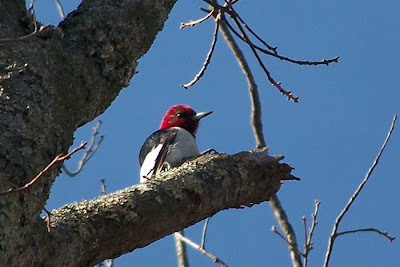 Red-headed Woodpecker at Cox Hall Creek WMA. 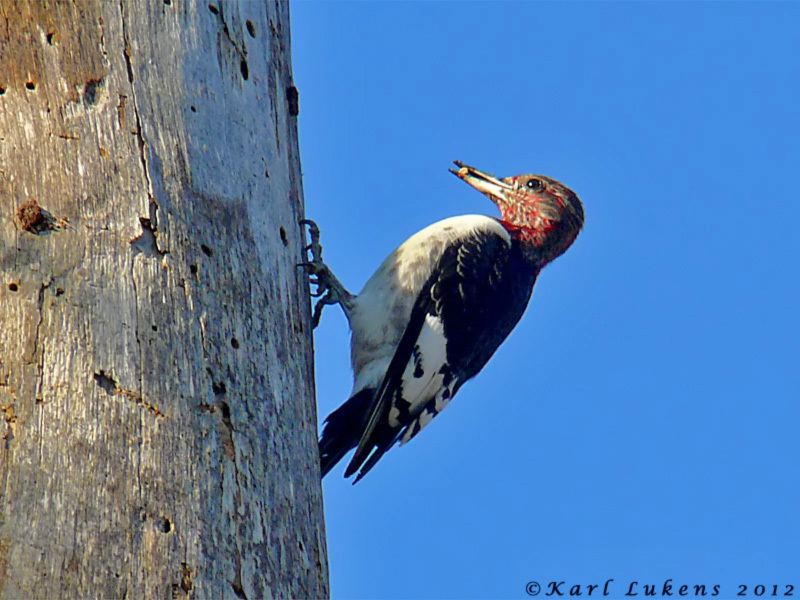 The birds at this site are displaying interesting caching behavior of pieces of wood... [photo by Karl Lukens]. Lake Lily at Cape May Point continues to provide both visiting and resident birders with some great viewing experiences. Though duck numbers have dwindled this past few days, the first-winter Common Merganser continues to hang out there and what appears to be a genuine Cackling Goose (as opposed to the small, but larger-billed bird that has also been around) was present today. A Tree Swallow flew over the lake lunchtime and was perhaps one of two seen shortly after along the beachfront near Harvard Avenue - where the male Dickcissel continues to consort with the House Sparrows. Two Tree Swallows were also in the area on 11th. Two Glossy Ibises appear to be overwintering at the South Cape May Meadows and get reported periodically, while today produced a fairly major Tundra Swan movement, with Chris Vogel reporting 10 over the point late morning, Michael O'Brien noting 50 west over Stevens Street and Tony Leukering reporting at least 70 heading west to the north of Miami Beach on the bayshore. Along the bayshore, a Black-headed Gull continues to be reported sporadically in the North Cape May area (today off Beverly Road in Town Bank) and Tony Leukering totalled 295 Bonaparte's Gulls and seven Forster's Terns at Miami Beach on 11th. Tom Johnson sneaked back into the area today I discovered, by virtue of the fact that he reported a light morph Rough-legged Hawk near mile marker 21.2 on the Garden State Parkway. Perhaps most surprising is the continued reporting of Monarchs, with one noted in flight by Michael O'Brien at the point today. 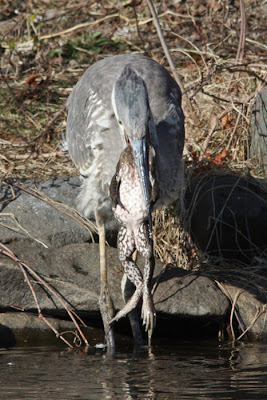 First-winter Great Blue Heron enjoying Bullfrog - a local delicacy at Lake Lily! 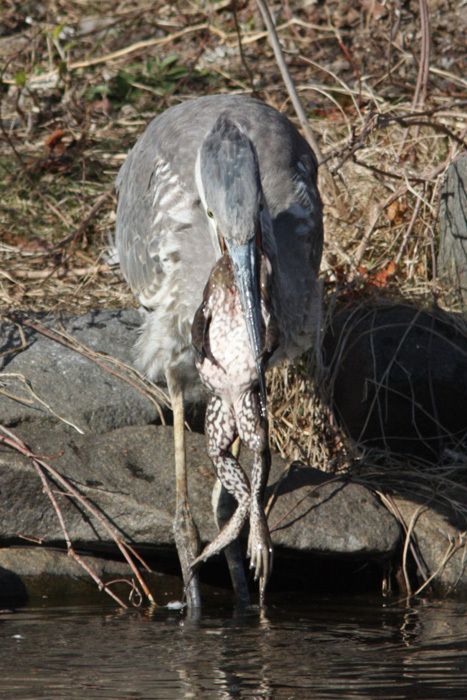 Herons are hardened predators and will eat a very wide range of animals, including mammals and birds [photo by Beth Polvino]. 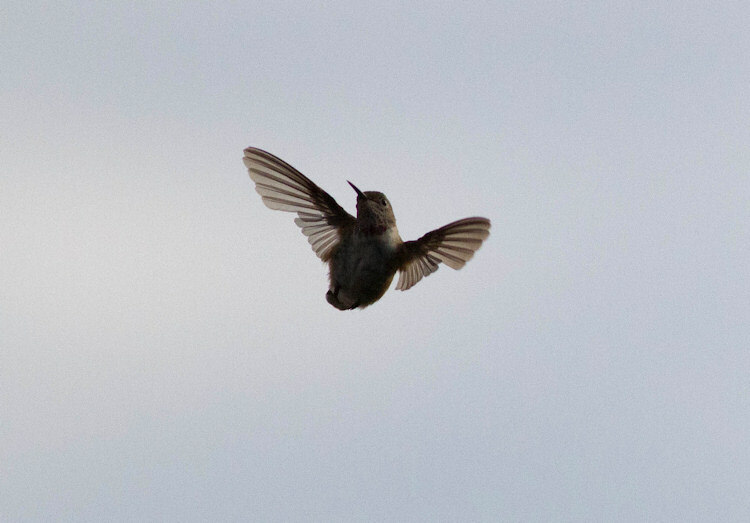 Despite some pretty frosty nights, the two Rufous Hummingbirds being reported from CMBO's Goshen Center and along New England Road in Lower Township continue to hang tough. If the truth be known, however, the New England Road bird (seen above) has so far evaded the best attempts to confirm it conclusively to species [photo by Tony Leukering]. 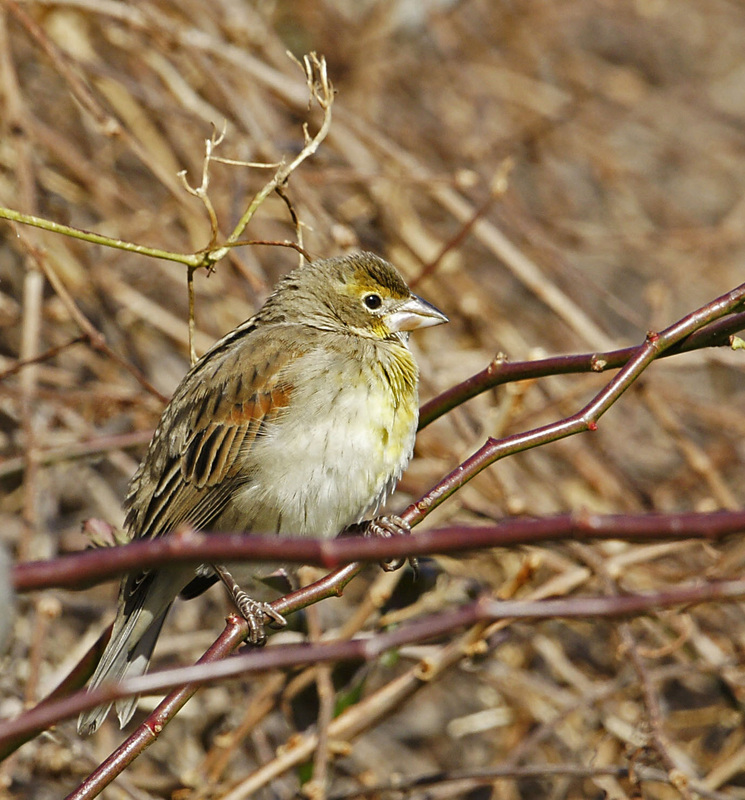 This male Dickcissel has become very confiding along Harvard Avenue, usually on the corner of the vacant plot at the intersection with Whilldin Avenue [photo by Mike Crewe]. The weather doesn't quite seem to know what to do at the moment as it bounces between unseasonably mild and flurries of snow, then back again. Overall, though it is certainly a vast improvement on the last two winters when we have had over two feet of snow at Cape May - not much for those of you up north or out west I know, but far from expected here at the cape. Certainly mildness prevails, as shown by reports of a Monarch at Cape May Point State Park on January 1st and another (or the same?) feeding at pansies in a wildlife garden at Cape May Point on the 8th. Orange Sulphurs continue to be seen too, though no dragonflies have been reported to me so far this year. Winter is all about raptors and waterbirds and, though the mild weather is probably keeping total numbers relatively low, there is certainly an excellent range of species of both groups around. Ar least two Rough-legged Hawks are being regularly seen at Tuckahoe WMA and good numbers of Northern Harriers and Red-shouldered Hawks are wintering with us. Reed's Beach has good numbers of Common Goldeneye (51 counted by Sam Galick on 7th) and Greater Scaup offshore and all can be enjoyed against a wonderful background of displaying and whistling Black Scoter. 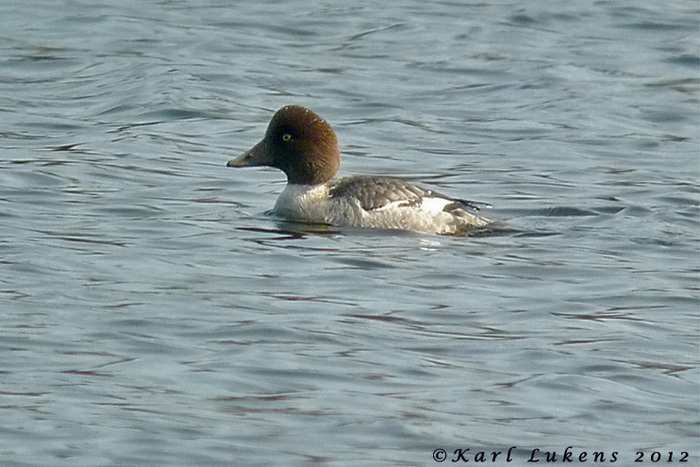 Lake Lily continues to attract a range of interesting waterbirds, including a male Greater Scaup as well as all the previously-mentioned goodies. Occasional reports of a Cackling Goose from there appear to involve a rahter odd, small Canada Goose judging from photos I've seen. The male Eurasian Wigeon keeps moving around for some reason but of late has mostly been on Bunker Pond in the state park. The male Dickcissel continues to hang out aong Harvard Avenue with the local House Sparrow flock while a female was at the Northwood Center feeders on 6th and seen briefly early morning on 7th. Later on 7th, two were seen at the south end of Lake Lily. Perhaps thanks to the mild weather, a few birds are hanging on that we would normally expect to be well south of here in January. These include the Bell's Vireo at The Beanery (to 7th at least), Northern Waterthrush at Cape Island Preserve (7th), three Palm Warblers at The Beanery (8th) (two western, one eastern form) and a juvenile Little Blue Heron at Two-mile Landing (8th). Slightly less unexpected are a Yellow-breasted Chat at The Beanery (to 8th at least) and an Eastern Phoebe at Goshen (2nd). In contrast, 'hard weather' birds are thin on the ground with six American Tree Sparrows being noted at Tuckahoe WMA but none noted so far around the point, and very few Fox Sparrows around. Indeed, I have had several phone calls about backyard feeders being left untouched and the food going to waste. But don't worry, the birds haven't all suddenly plummeted in number, they are just enjoying themselves further north, or out in the backwoods where there is plenty of natural food for them. If you have few birds at your feeder, put less food out and keep it somewhere cool and dry where it will last until the birds need it. Black-headed Gull at North Cape May on the bayshore. Back to 'typical' winter reports, a Razorbill was seen by Don Freiday on the water just off Two-mile Beach on 8th and Black-headed Gulls were reported by Jim Dowdell at Heislerville on 3rd and by Michael O'Brien on the beach in North Cape May on 8th. Finally, a Common (or Eurasian) Teal was reported from the South Cape May Meadows on 7th according to Jerseybirds but there has been no further details or sightings so far. 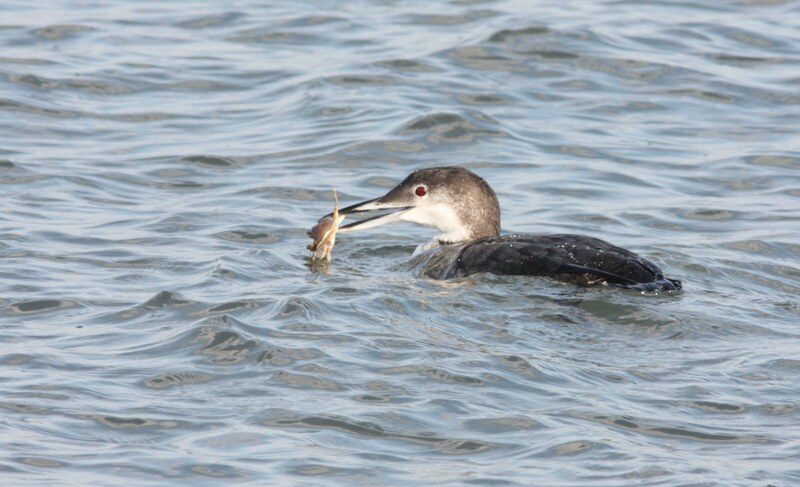 Common Loons are very adept at catching and dealing with small crabs. 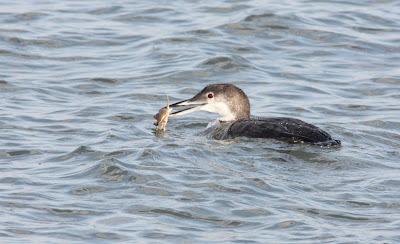 Note the bird's large, angular head which rules out Red-throated Loon. 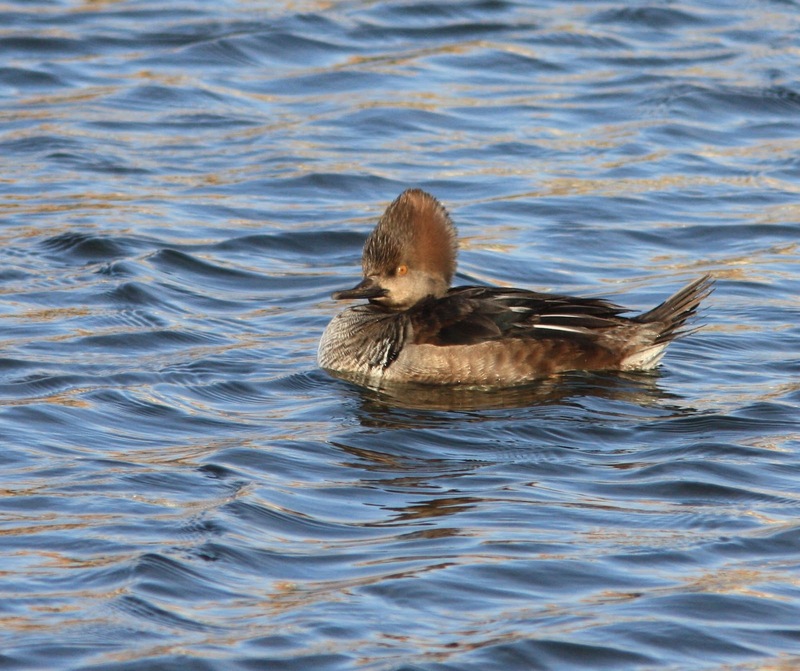 When is a female Hooded Merganser not a female Hooded Merganser? Answer - when it's a first-winter male! The males of many duck species have a female-type plumage in their first fall, which is partially replaced gradually during their first winter. This bird shows several clues to it being a young male: an all dark bill, a pale eye and some black and white markings creeping in on the breast sides and wing coverts. A classic adult male Hooded Merganser - hood up and ready for action! Another one of those first-year male ducks! 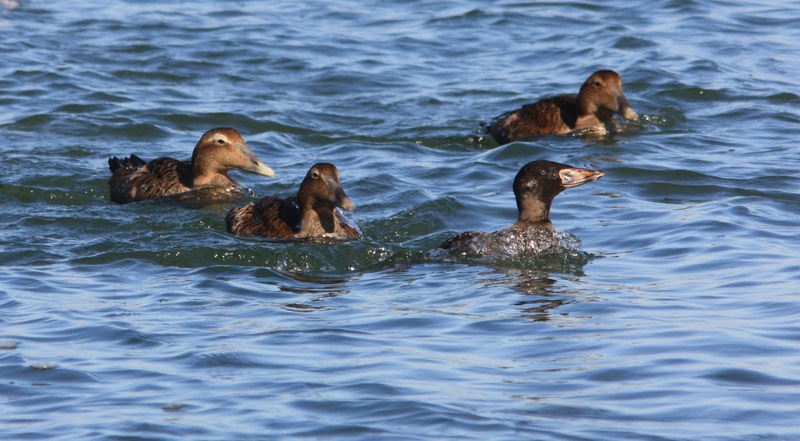 Here, three Common Eiders are joined by a young male Surf Scoter (front right). Though brown like a female, note the size and color of the bill which is starting to develop the features of a typical male bill. Take a peak at any keen birder's list of species seen, and I am willing to bet that, on most of them, there will be a couple of gaping holes; a couple of extended runs of blank spaces just waiting to be plugged up with big fat ticks. Those gaps - I'm willing to bet a fair amount on - will fall shortly after the ducks and before the herony things and right in the middle, just before the pigeons. Here, of course, we will find those sneaky birds that prefer to be out there beyond the horizon, in far 'eastern' New Jersey, beyond the land-based eyes of mankind. Help is at hand, however, and your next opportunity to boost your New Jersey, Cape May, or even your Life List could well be on February 4th. On that date, staunch CMBO supporter Paul Guris will be heading out on the Atlantic Star from Wildwood, with a full day offshore seeking out seabirds and other marine life. 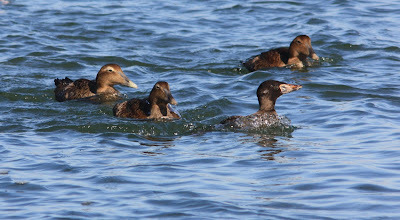 Similar trips in the past have produced excellent numbers of Dovekies and Razorbills (and it seems to be a good year for both species this winter off New Jersey) and possibilities for Northern Fulmar, Great Skua, Manx Shearwater, Common and Thick-billed Murres and a nice range of whales and dolphins. I would strongly recommend this trip if you want a real shot at seeing some of these fabulous birds - but don't forget, there are no guarantees! On the other hand, if you don't go, you certainly won't see them!! For fuller details and booking information, visit: the Paulagics website. A cold spell has descended on Cape May and we awoke to a sprinkle of snow this morning. Not the heaps we had the last two winters, but temperatures have dropped as low as 16F the last couple of nights which is enough to make many a skunk cough a little! The Rufous Hummingbird at CMBO's Center for Research and Education at Goshen was struggling yesterday, as freshly-filled feeders were freezing within a half hour of being put out, but she made it through the day and has been seen again today. Pat Young tells me that the other Rufous Hummingbird that is wintering just south of the Cape May canal along New England Road was also still around on Wednesday morning at least. As of this morning, the female Common Merganser and female Redhead continue to show well from the warmth of the Northwood Center, amongst a gathering of some 200 Gadwall and a mix of Ring-necked Duck, Lesser Scaup, Northern Shoveler, American Wigeon, American Coot and other waterbirds - including at least six Great Egrets. The feeders here are currently attracting at least one Fox Sparrow - in short supply here in this relatively mild winter - and a male Yellow-bellied Sapsucker. Talking of winter birds reminds me that our 'Winter Warmers' Workshop will be upon us soon and still has just a few places left. 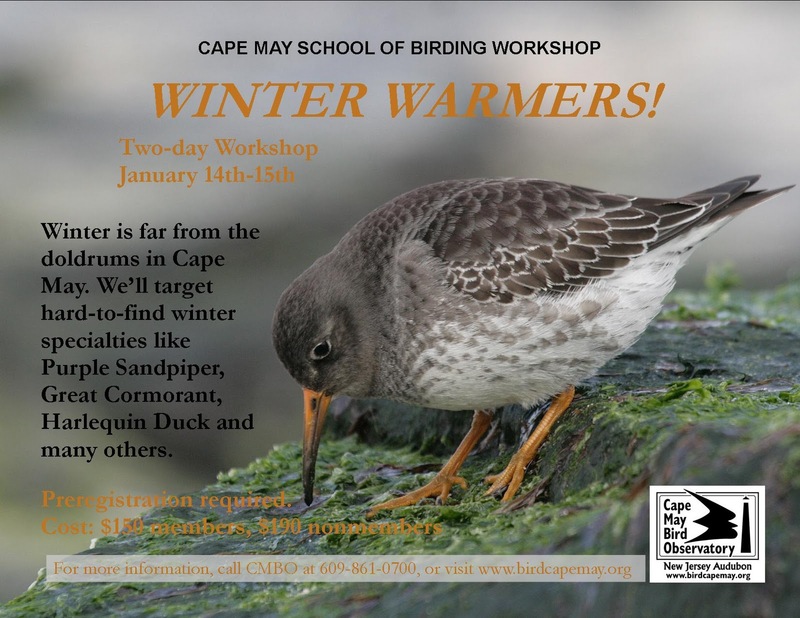 This always gives us a great opportunity to get out and learn the winter specialties of the Cape May region and mixes field birding with an indoor session to help all that information make sense. Indeed, with a great range of birds around at the moment and the forecast of relatively mild weather on the way, this year could be the right year to do this workshop - see you there! Kicking Off The Year List! Our annual 'Kick Off Your Year List' event took place today and we really did have a great day out under almost cloudless skies and mild weather. We started at Cape May Point State Park - more from habit than because of anything unusual in the area and we were soon adding up a nice list of the commoner birds of Cape May. Some of the highlights included four Baltimore Orioles feeding on Juniper berries with an American Robin flock, Great Blue Heron (the first of four seen today) and a nicely perched Red-shouldered Hawk - yes, it really was a Red-shoulder folks, despite some confusion at first! At least a dozen Forster's Terns were in The Rips, along with one or two Northern Gannets, Black Scoter and Red-throated Loons. 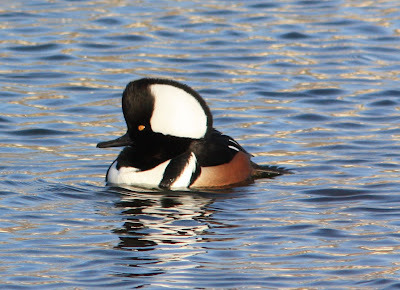 A walk through to Lake Lily via Lighthouse Pond added various ducks, including Ring-necked Duck, Hooded Merganser and the female Common Merganser that has been around for a few days now. We walked back to the state park via Harvard Avenue where a Dickcissel that has been hanging out with a House Sparrow flock showed amazingly well. The morning was already running away from us but there was still time to visit The Beanery where - against all bets - the Bell's Vireo appeared almost immediately and showed in full view for some 20 minutes in front of the whole group. Time for lunch, then we met back up again at Avalon where we checked out the avian goodies in Townsend's Inlet. With continuing mild weather, duck numbers are fairly low here this winter, but we still had a nice tally, with Long-tailed Duck, Surf Scoter and Common Eider, several Common Loons and three Horned Grebes, while I also heard of a White-winged Scoter seen by some of the group. Purple Sandpipers were on the rocks too. A short drive brought us to Stone Harbor Point where the beach was buzzing with activity as usual. Sanderling and Dunlin dominated, but two Red Knots and a few Black-bellied Plovers were here too. Our day was closing fast so we finished off on Nummy's Island. Here we added Great Cormorant, three Buffleheads and a distant Peregrine to our lists then watched the sun set behind a gathering shorebird roost that included several American Oystercatchers and five Marbled Godwits. A great day, and many special thanks to all those who took part and made this yet another very special Cape May experience. I've put a full bird list for the day on our Field Trip Reports page. Least Flycatcher on the red trail at Cape May Point State Park; Osprey at mile marker 3.8 on the Garden State Parkway, five Marbled Godwits and three Short-billed Dowitchers on Champagne Island off Stone Harbor Point; Whimbrel and Glaucous Gull at Turkey Point in Cumberland County; Glossy Ibis at South Cape May Meadows; adult Black-headed Gull at Miami Beach in Villas.